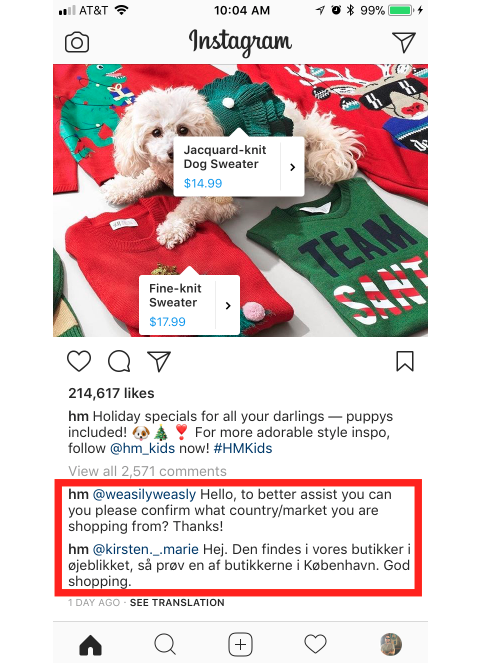 For retailers across social media platforms, the biggest question many have is how to turn Instagram into a more retail-friendly network. 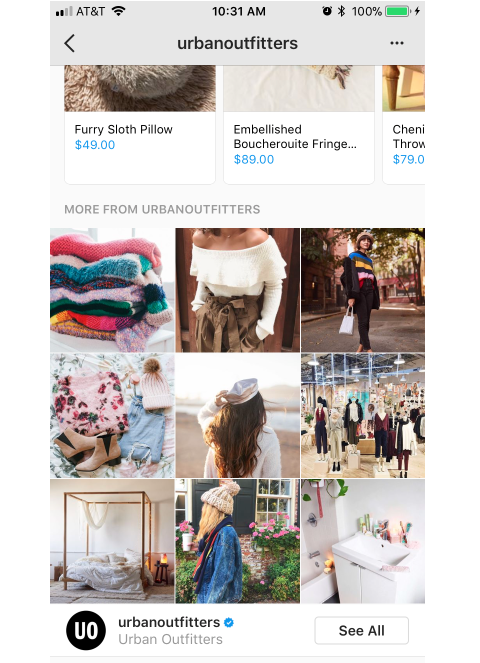 Instagram shopping isn’t a new idea, but the Facebook-owned network is stepping up its multidimensional posts to drive more sales. Brands have always relied on Instagram for shopping because of its highly-visual settings. Users can see multiple images or videos of products, but making the move to purchase has always been a struggle. That’s due to the apparently set-in-stone rule of one link per account and only in the Instagram bio. However, now the network is using interactive posts with a clickable button called Instagram Shopping. This allows users to see a product and click the button Tap to View Products that showcases more options of the item. Instagram Shopping, or Shopping on Instagram, is the newest way for businesses to use visuals to tag up to five products within an image for more information. These tags show how much the product costs, a description and a link that sends users directly to a website to buy the product. Currently, Instagram Shopping is only available on images and organic posts. While you cannot promote this new style of visual retailing, your brand can take advantage of organic Instagram engagement to drive more awareness about your products. 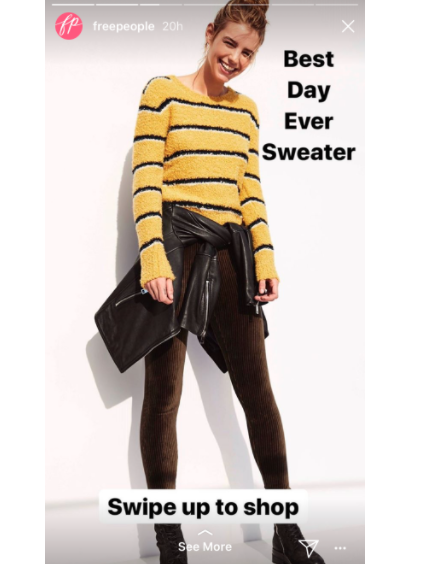 In order to use Instagram Shopping, you need to have an Instagram business account, use US dollars for pricing and can only promote physical products that are approved by Facebook Shop. After your brand is approved, you will have the ability to tag products on your organic posts with link info as well. Now that you know Instagram Shopping, the question is how can your brand implement it into your Instagram marketing strategy? It’s not as simple as just throwing some links in while you sit back and wait for floods of new sales. As we mentioned above, there’s a bit of a process before you can start using Instagram Shopping for your business account. Brands have to get a few things in order before setting up shop, but luckily, it’s not too difficult to get started. Switch to a Business Profile: We mentioned this before, but you have to connect to Instagram as a business profile before being accepted for Instagram Shopping. Update Any Business Info: You can’t own a private account and claim a business profile–so double check your information on the account in settings. Add an Email, Phone Number and Address: Lastly, you need to enter an email, phone number and physical address for the profile. Connect Your Facebook Page: On your brand’s Page, you can select the product catalog to connect to your Instagram Business account. As a reminder, you can only attach one Instagram Business account to a single Facebook Page. Tag Products: Once connected, your first image you will want to select Tag Products and add up to five products per image. Here you can search for your product names, which Facebook will pull from your product catalog. This should upload the correct link to your product pages. Share Your Post: Lastly, share your post to your feed. But remember it’s only available for organic content, so make sure you learn the best times to post to Instagram for the consumer goods industry. OK–so you’re approved and posting Instagram Shopping content. But is it actually driving engagement? If you’re not seeing the comments, likes and clicks, your push to move users to your specific landing pages is going to be even harder. First and foremost you have to think about Instagram engagement as a true source for boosting return on investment and clicks to your site. Engagement is about making real connections with customers on social and making users feel appreciated. In fact, our Sprout Social Q1 2017 Index discovered 30% of millennials engage with brands on social at least once a month. To add to it, 71% of users say they’re more likely to make a purchase from a brand after a positive social experience. When you get comments, make it a priority to respond. Think of each commenter as a current or potential customer. Can you really afford to ignore them? 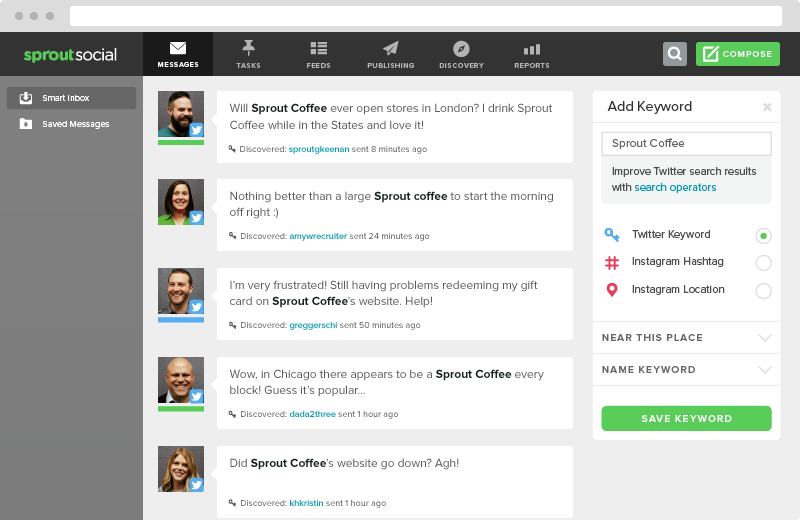 By using a powerful social media management platform like Sprout Social, you break through the noise of low-value messages and find those golden opportunities for engagement. Brands use tools like this all the time to improve their social strategy, but we provide next-level engagement features to find keywords, brand mentions and other conversations you’d normally miss in a social search. As you start to develop more engagement opportunities, then it’s time to look at your content. 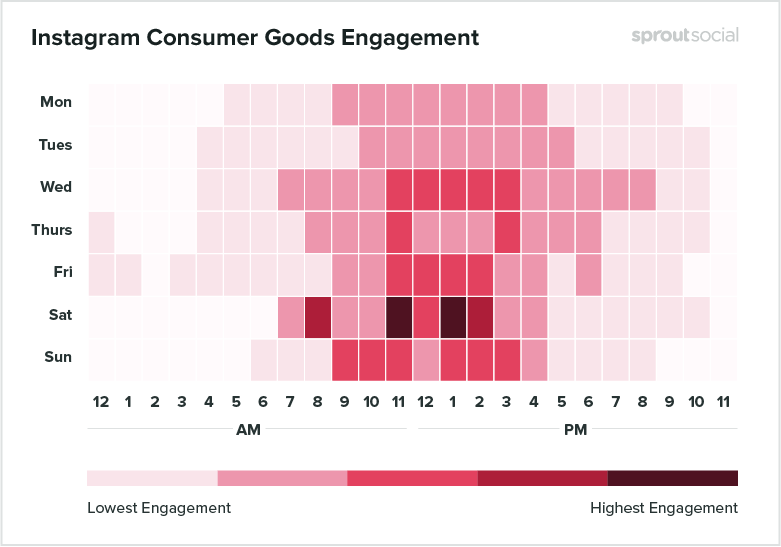 What Instagram posts drove the most engagement? What made that image so particularly interesting or why did users react positively? Ask these questions about your content and try to find the common theme. Over time, you should apply these tactics to your own Instagram Shopping content to drive the most engagement per post. The 10x concept was created by Dan Sullivan, a world-renowned entrepreneur, whose idea was simply to generate 10 times the growth you think you could already produce. The terminology is also used with “10x content,” which is content that aims to be 10 times better than your competitors. You can apply that same concept to 10x your sales with Instagram Shopping by providing something no one else has, or that is uncommon in the industry. Let’s be honest, if you’re already looking into the Instagram Shopping feature, you’re trying to get ahead of the game and likely do something your competitors aren’t. However, to take on this 10x growth, try providing only the top-of-the-line visual content that will set your brand apart. This means you should look into hiring a professional photographer for the highest-quality images. Another way to provide even more to your customers is with detailed descriptions and links to more visuals in the Instagram link. This is located in the first link you click, which provides more info on cost and the product. But this where you need to shine. Make sure there’s nothing your customers are left asking besides where’s checkout? The prospect enters your Instagram channel to gain more info, but once you can get them to click to your product page, it’s a lead. All 10x strategies should be focused on driving more leads and qualified sales leads than any other content. If you’ve figured out what Instagram content works best, see how you can take it even a step further. Any highly successful sales funnel needs a solid end-to-end customer journey. It takes more than solid content to get users to go to your online store, so always put emphasis on an easy customer journey. With Instagram Shopping, you’re hoping a user moves from a random organic post in their feed, to a more descriptive product, to a link to your online shop. The skate apparel company Emerica does an amazing job showcasing its product and providing a complete customer journey to the exact shoe a user might want. These steps might seem simple enough, but for any retailer, it’s easy to lose your prospects in the customer journey. Let users pick and choose between products. Offer various products to show exactly what’s available or the most popular items you can purchase. This will prevent cart abandonment down the line. Make the landing page match your Instagram’s aesthetic. Moving from page to page (especially on mobile) can be awkward. Ensure your customers are greeted to a landing page that closely resembles your Instagram feed. Also let users know that they’ve arrived from Instagram to avoid any complications. Engage customers in a timely fashion on these posts. This is the engagement gold we discussed earlier. Make sure you respond, like and react to the appropriate comments in a timely fashion to create positive experiences. Promote posts in Instagram Stories. Since you cannot promote through paid, try using Instagram Stories to showcase the various product details in your feed. Keep the instructions minimal, but get users to view your feed like an online store. Create a feasible storyline between viewing and purchasing. No matter what you’re selling, you need to create a storyline to connect users from first intentions to purchasing. Don’t skimp your marketing strategies on Instagram and work to create the best storyline for customers. Like any social media marketing strategy, one of the final steps should be to review your data and see what worked. The same goes for anyone using Instagram Shopping and to improve on the future, you need to measure content performance. Luckily with Sprout Social, you can track your most critical Instagram metrics within an easy-to-use dashboard. 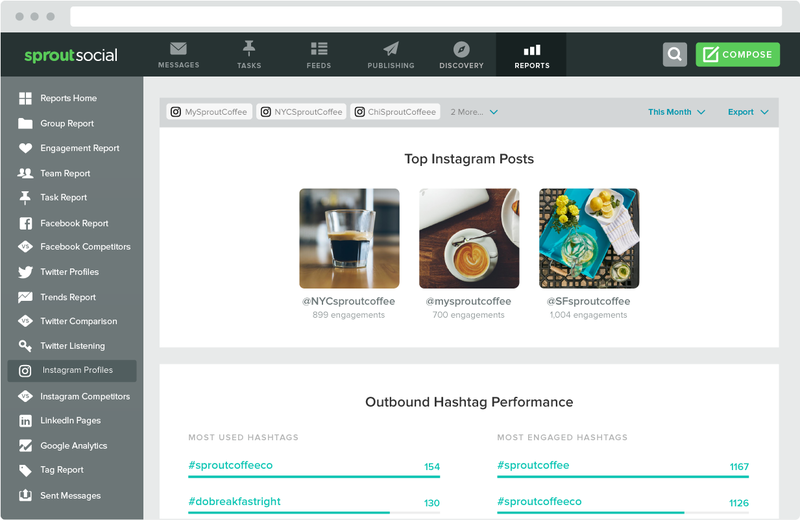 Sprout provides some of the most powerful reports to dissect your Instagram posts. 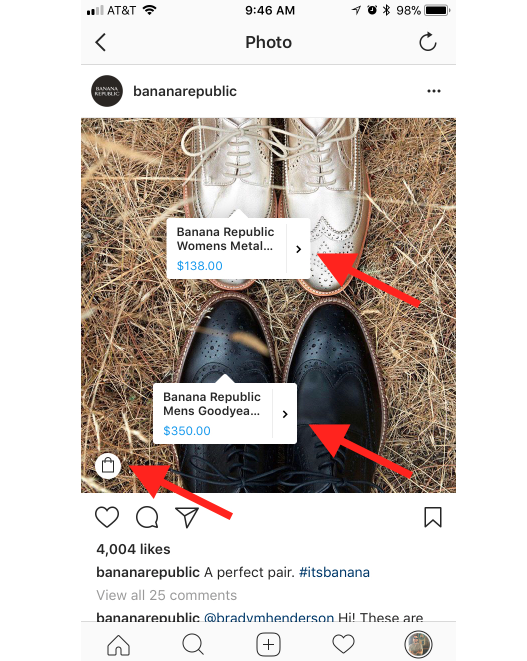 It’s simple to see which posts performed the best in your Instagram Shopping campaign and to track the comments and engagement metrics associated with each image. 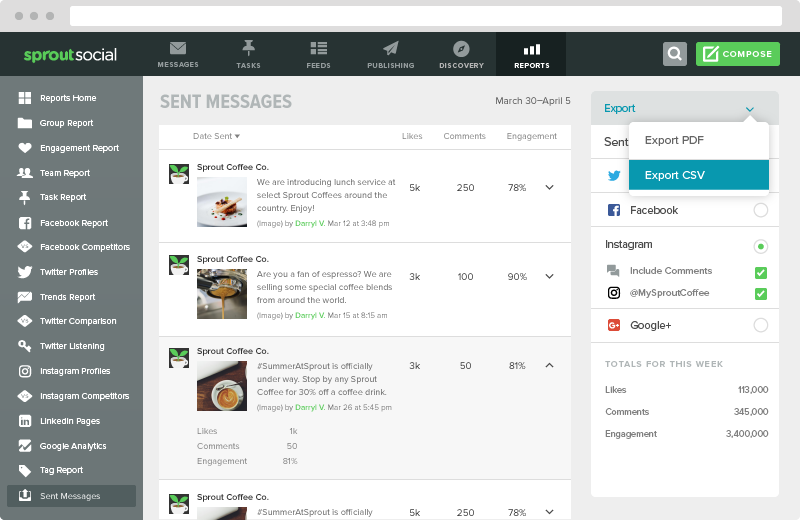 Our Sent Messages Report gives helpful insights into what posts are driving the most engagement. To continually shoot for the moon with Instagram Shopping, you have to uncover every positive and negative. This will allow you to create more successful posts and look at the trends that make your specific images so popular. We’d love to show you everything we have to offer with your next Instagram Shopping campaign. See us in action by starting a free 30-day trial today! Have any other recommendations for Instagram Shopping? Leave a comment below or chat with us on Twitter!